Dunking these puppies in coffee is something akin to an Americanized Tim Tam Slam. Just as the center of a Tim Tam liquefies in the hot beverage, so too does the creamy center of these mocha-flavored sandwich cookies. And it would disintegrate and fall directly into said mug of hot coffee if not for being slurped up by some fat Yank who should no doubt be eating fewer sandwich cookies. 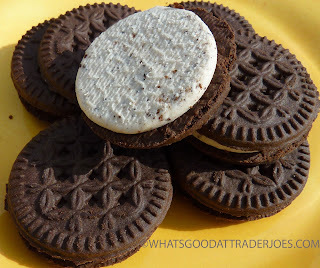 But if you're gonna splurge and eat sugary sandwich cookies, these are the ones to reach for. I'm not even that big into sandwich cookies in general. And I've mentioned many times that I'm not really a coffee person. But these magical Joe-Joe's are pretty delicioso if I do say so myself. Sonia, the coffee connoisseur, agrees. 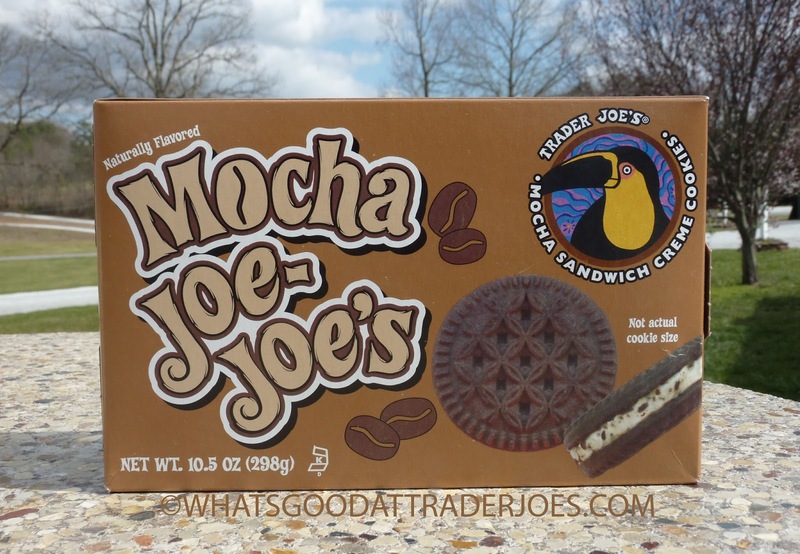 She had a mug of coffee made within seconds of getting these cookies in the door, and moments later, these Mocha Joe-Joe's were swimming in java. I must admit, they taste pretty amazing when dunked. I'm guessing hot chocolate would work, too, but for some reason, coffee and these cookies just go a little too well together. Seventy cups to kill a person? I don't think I'd ever go that far. But I think I've already had enough to give me a headache, thanks to these yummy dunkables. They're so good, they hurt. When consumed sans café, they still taste pretty coffee-esque. They do contain real ground coffee beans, but "cocoa" appears even higher on the ingredients list. I guess coffee beans are the more potent of the two, because these cookies are heavy on the coffee side of the mocha equation. They're a little earthy, but they're still very sweet. Flaunting the texture of other classic Joe-Joe's, they're the newest experimental flavor at Trader Joe's, but far more successful than those Mango fellows from last year, if you ask us. $2.99 for 22 cookies, kosher, tasty, and über-dunkable. Four and a half stars from Sonia, four from me. I do love me some cookies and likewise, probably don't need to be eating them either. Can't say the Yank part, because I'm from the deep South of Mississippi. TJ's seems to have a coffee takeover season! Coffee flour, coffee glazed nuts, coffee caramels, and more coffee!!! I like that they added coffee beans in there to bump up the coffee than just coffee flavor. They are ahead in Oreos game. Coffee is the new mango is the new pumpkin! I bought a bag of a new Joe's Dark Coffee Squares non-chocolate tonight. For those that really love the flavor of coffee this maybe a unique treat for you. If you're expecting a strong chocolate flavor this may not be for you. I was a little conflicted on the first taste but as I chewed I really enjoyed it. Strong coffee cocoa butter flavor but not bitter. They say they're caffeinated to some small degree but do not give the level of caffeine. I'm imagining it is not significant but you probably wouldn't want to have this at night if you are sensitive to caffeine. 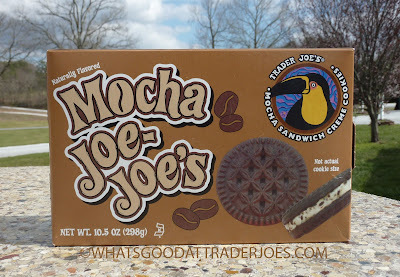 How can I get these - I owe my husband a whole box- as I couldn't stop eating them, and ate the whole box-- Now I heard that they are discontinued in the store we normally go to!!! my ABSOLUTE favorite cookies!! Have boxes in the freezer. Hope they become permanent.